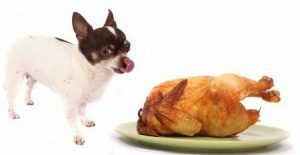 Don’t Stuff Your Dog with Bad Food This Holiday! With Thanksgiving in just a few days and Christmas not too far behind, families across the country will be getting together to celebrate these holidays, and many will include their small four-legged friends in the festivities as well. Now while they won’t be sitting at the table – at least in most cases – that isn’t going to stop people from feeding Fido some table scraps. Be careful what you feed them, though, as numerous different foods could make your dog very sick. If you have any food that is oily or has been cooked in oil, do not put it anywhere near your dog’s mouth. Consuming it could lead to diarrhea, vomiting or even pancreatitis for your four-legged friend. You should also avoid feeding them any scraps that were cooked with onions or that have onions as an ingredient, as the thiosulphate in onions can make them very sick. When dessert comes out, make sure they don’t eat anything with chocolate. This delicious treat for people can cause abnormal heart rhythms or even death for a small dog. If you want your dog to be able to feast on the holiday’s you could make them their own treats from custom recipes so they won’t get sick. You also give them some holiday turkey, but only fully cooked, unseasoned poultry and without any bones. Any added salt or gravy or undercooked meat can make them sick, and small bones can lead to digestive problems – even internal bleeding in extreme cases. Still looking for the perfect friend to add to your family or considering adopting a new pet during the holiday season? Pauley’s Pups specializes in small dog breeds, and we’re sure to have the right dog for your family. For more information on our available pups or to inquire about upcoming litters, contact us today.